Television is an exciting and engaging platform that delivers immediate scale making it the most effective way of building brands and driving fast-track growth and profit for businesses. There is a common misconception, however, that TV advertising is only viable for big brands with large budgets but we’d like to change your mind. 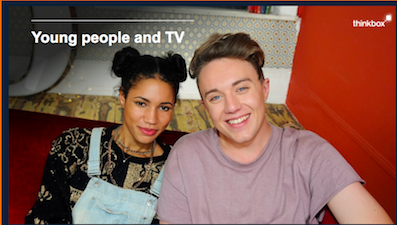 TV can be accessible, affordable and effective for advertisers of all sizes. At ITV we also offer help and advice in developing your ad through our in-house commercial production team who create and produce over 1000 commercials a year, all at cost. 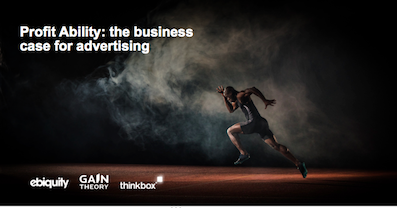 Thinkbox is the marketing body for commercial TV in the UK. It works with the marketing community with a single ambition: to help advertisers get the best out of today’s TV. Its shareholders are Channel 4, ITV, Sky Media, Turner Media Innovations and UKTV who together represent over 99% of commercial TV advertising revenue through their owned and partner TV channels. 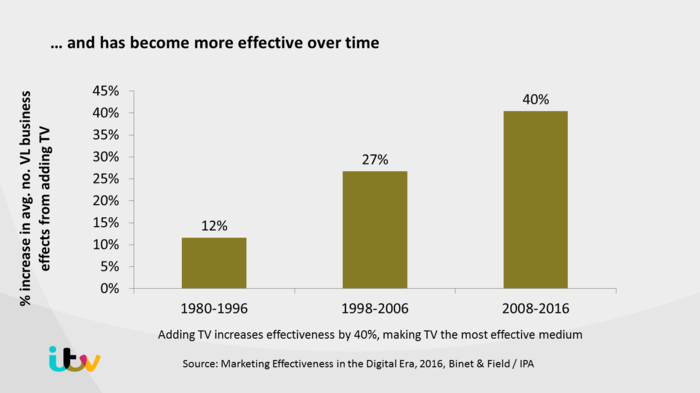 View all the killer evidence which explains how and why TV is the most effective form of advertising - and is in fact becoming more effective. 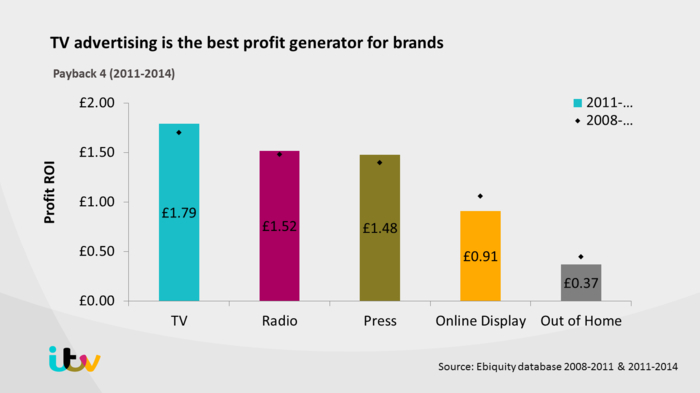 The latest research by Ebiquity and Gain Theory re-frames the way marketers should be thinking about their media investments. Businesses are under colossal pressure and marketers have to meet challenging short-term targets whilst trying to build long-term, profitable brands. This study looks at the business impact of advertising and crucially examines the impact in both the short and long term. 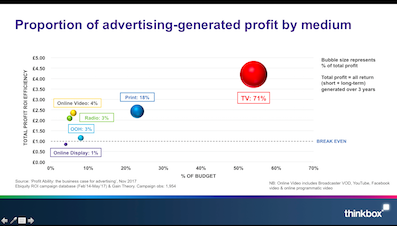 It is the first study of its kind and moves beyond often misleading ROI ratios to show the volume of profit that different forms of advertising generate. 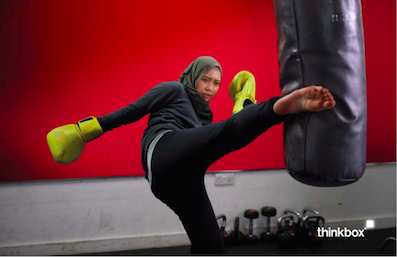 It shows the genuine difference that advertising makes to the bottom line. Take a look at some of the biggest themes in advertising at the moment and how they touch TV. 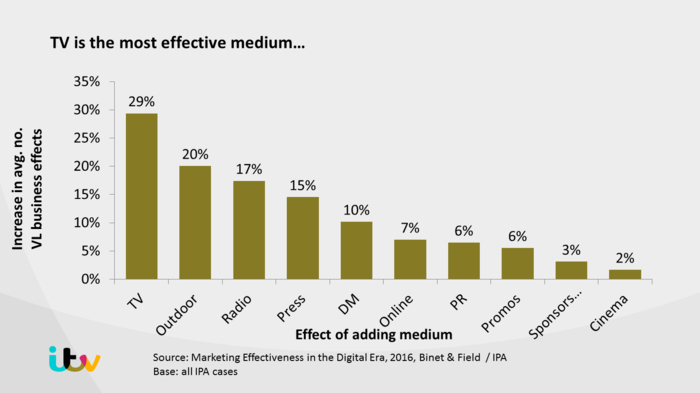 Things like brand safety, the expanding world of video, what young people are doing, and, of course, advertising effectiveness. Click here to find out more.